Israel's Ambassador to the U.S. credits Democratic nominee with the leading role in achieving a ceasefire after Operation Pillar of Defense. Israel's Ambassador to the United States Ron Dermer credited Hillary Clinton with the leading role in achieving a ceasefire in Israel's 2012 conflict with Hamas, JTA reported Thursday. Clinton flew to the region and conducted shuttle diplomacy between Egypt and Israel to end hostilities between Israel and Hamas through indirect negotiations during the 2012 Operation Pillar of Defense. Dermer said that because of the quick ceasefire, the eight-day conflict was the only one of Israel's three rounds of fighting with Hamas to not include an Israeli ground operation in Gaza. "She came in and had to get it right, and had, I think, basically one shot," Dermer said at an event hosted by the S. Daniel Abraham Center for Middle East Peace at the Democratic National Convention in Philadelphia. "A lot of lives were saved." The Ambassador added the talks defined "how the U.S. and Israel work together as allies." Clinton includes her efforts for a ceasefire in Gaza on her list of achievements during her tenure as Secretary of State. The other achievement which pertains to Israel is the nuclear deal with Iran. 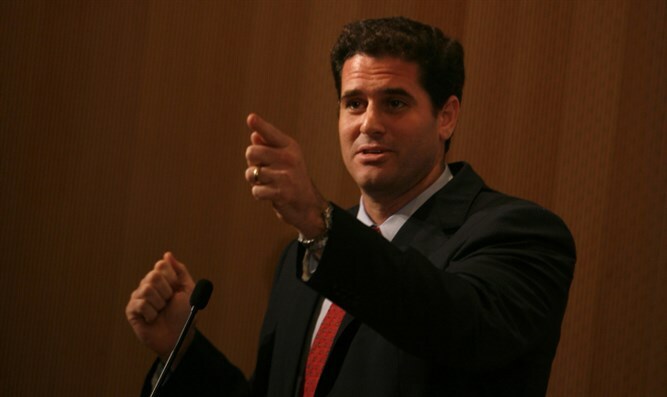 During his talk, Dermer also defended Israeli construction in Judea, Samaria and Jerusalem. The comments came a day after yet another sharp condemnation of Israeli construction by the U.S. State Department. Dermer admonished the international community for criticizing Israeli building in areas that would likely remain part of Israel even after an agreement with the Palestinian Authority (PA), adding that residents living deeper in Judea and Samaria should, in the event of Palestinian statehood, be given the option of gaining citizenship in that state. "When you think settlers are undermining the prospects of peace, you are saying Palestine must be 'judenrein,'" he said, using a Nazi German term meaning "free of Jews." "There is no reason, concretely and in principle, why Jews should not be able to live in a future Palestinian state," added Dermer. PA chairman Mahmoud Abbas has, in fact, several times stated that the future Palestinian state will be free of Jews. Dermer said the next U.S. president should pursue the peace process by engaging with the PA and the wider Arab world on parallel tracks. As Israeli Prime Minister Binyamin Netanyahu has suggested, Dermer said shared opposition to Iran and the Islamic State terror group could draw Israel and Arab states closer together. "The Arab states in the region understand the dangers of Iran, understand the danger of ISIS, and see Israel as a potential ally in that struggle," he said, according to JTA. "One of the opportunities for a new administration is to take this new realignment in the Arab world and see how to translate that into a policy that advances peace."